Reversible Destiny Foundation is pleased to present Shusaku Arakawa: Trans Japan, Cis Japan - an article by Dr. Shin-Ichi Fukuoka about the works of Arakawa and Madeline Gins. Originally published in Japanese in WINGSPAN February 2016 issue, pp. 80-6. Translated and republished here with permission from the author and ANA WINGSPAN - the monthly in-flight magazine from All Nippon Airways. Dr. Shin-Ichi Fukuoka (b. 1959, Tokyo) is a biologist, Professor at Aoyama Gakiuin University and Visiting Professor at Rockefeller University in New York City. He was the recipient of the Asahi Shimbun Science Promotion Prize (1987) and The Japan Bioscience, Biotechnology and Agrochemistry Society Award for the Encouragement of Young Scientists (1997). Dr. Fukuoka has published more than 80 original papers in prestigious scientific journals, including Nature. He is also a renowned writer of award-winning books bridging the gulf between the two cultures of science and the humanities. 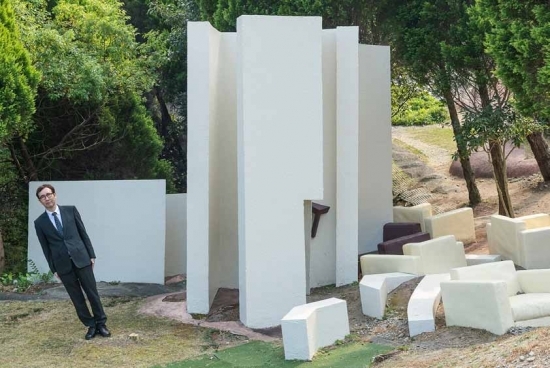 I paid a visit to a giant artwork made by contemporary artist Shusaku Arakawa, along with Madeline Gins, in Yoro, Gifu Prefecture: Site of Reversible Destiny. I slowly ascended the slope. I had a strange premonition, and I put all the more strength into stepping firmly on the ground. It was a disquieting sign, as if my senses were somehow being disturbed. The curved line of the cellular wall runs around the circumference. In this line are embedded receptors and channels, in the form of apparatus that exchange information with the extracellular world, penetrating the cellular wall. Within the cell the maze-like endoplasmic reticulum, the nested mitochondria, the centrosome that appears like a bundle of branches, the golgi apparatus with its piled up round lamella, the nucleus that housed the fine strings of DNA, all those sorts of cell organelles are arranged in a scattered formation. Strangely shaped structures are placed all around here, as if precisely corresponding to each organelle. Had Arakawa seen cells under a microscope before? Or is the thing expressed here perhaps the concept of everything in the real cosmos projected like a mirror reflection into the microcosm of a cell? This was the moment I first felt the ‘life’ at the center of Arakawa’s thought. Shūsaku Arakawa was born in Nagoya in 1936. Looking to pursue art, he not only progressed through art school, but in his mid-twenties he went to the US and settled in New York. Here he meets the poet five years his junior who will become his life partner, Madeline Gins, and from that point they begin to work collaboratively. What catapulted Arakawa+Madeline to fame was a conceptual art series called The Mechanism of Meaning. On a big picture plane, plus and dot symbols, or else diagrams that include color, are scattered all over. Under these, instructions are written: “Please think only of the dot not of the x’s.” In other words, forbidding the viewer from simply look at the artwork, participation or some sort of action becomes required here. In this prohibition, the process of human perception arises. The world was surprised by this mechanism. Werner Heisenberg, the winner of the Nobel Prize in Physics, showed considerable interest in Arakawa’s work, and it issaid that he had long chats with Arakawa. Not simply looking, but provoking participation and action. Arakawa’s intentionality was already emerging at this time. The scale of his intentionality was then enlarged and concretized as a more active force moving forward. The result was the magnificent monument completed in 1995: Site of Reversible Destiny. In the circular space of this basin a structure that seemed tobewitch the senses was arranged: a house standing slantwise, with dead-end hallways, maze-like rooms, and furniture embedded in walls. I tried challenging one amongst these features. There is one rectangular entryway bored into a sloping face. A narrow passageway continues inside. When I tried entering, I could see the dimly lit walls for a while from the slight bit of light that came through the entrance, but as I continued down the winding passageway, I was enclosed by a complete darkness. At that moment, a bottomless dread stealthily drew near. And at the same time, a voice in my heart told me to calm down. I closed my eyes and turned my attention to the sensation of the walls I could touch with my two hands. I perceived the direction that the hallway bent in and soon I could see a faint light at the other end of the passage, at which point I came to understand the passageway I had entered into. I realized the dark hole into which I entered was not really all that deep. What is darkness? What happens in the darkness? If I were to describe the intention of Arakawa’s work in one phrase, I would say that losing our sight in the darkness was not a loss, rather it was an opportunity to open new doors in our brains. A rich technique that more than made up for the loss; our senses aside from vision rise up, and we try to view the world via a new method. In other words, the darkness becomes the impetus by which we sense, bodily, the flexibility and mutability of life. In that moment, life exceeded our own bodies and spreads outward. That sensation is something that continues, even after leaving from the darkness. And then Arakawa proclaims, “Humans don’t die. I’m saying that they can’t die. I’ve discovered this. What we call humans can surely live forever.” It is true that he continued pondering the question of life. However, he did so using a completely different methodology than us biologists. 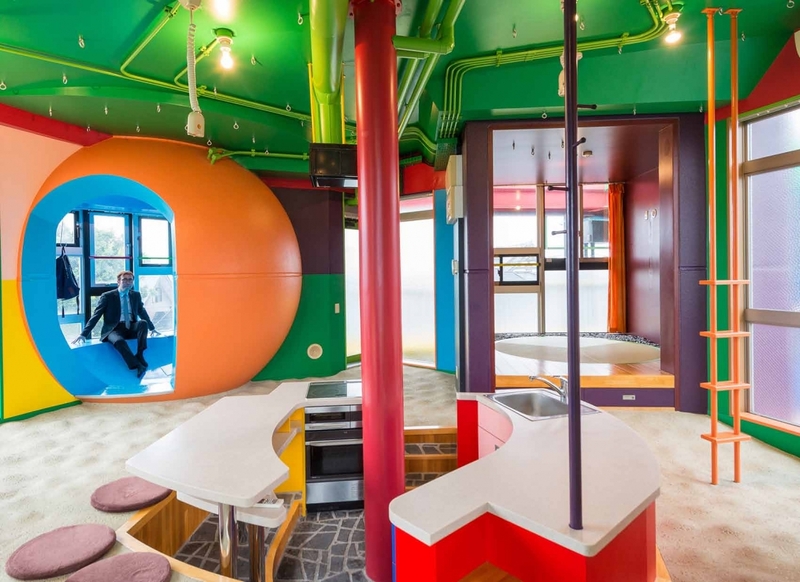 Ten years after the Site of Reversible Destiny, the Reversible Destiny Lofts Mitaka, in Mitaka City, Tokyo, were constructed as a place to realize “immortality.” Built along a major road, it’s a totally unexpected building that stuns those who visit. Cubic and circular columns are stacked on each other complexly. Their colors are red, blue and yellow. It’s as if a child lined up blocks capriciously. Momoyo Homma, the Representative of the Arakawa Shūsaku+Madeline Gins Tokyo Office, guides me on a tour and I observe the interior. Of the nine units that make up Reversible Destiny Lofts Mitaka, some are used for rental housing and some for short-term apartments. 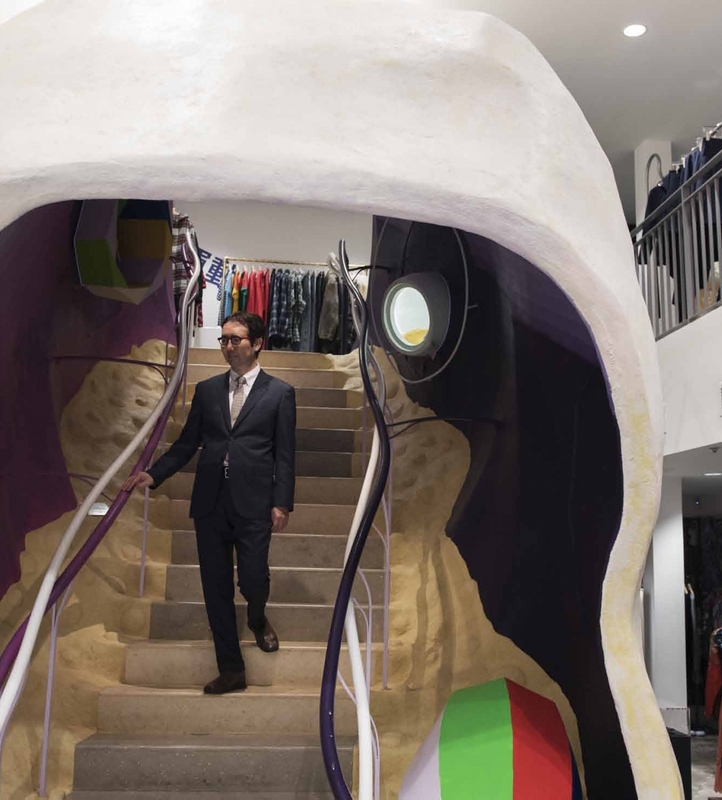 In reality, upon entering, you directly feel the unevenness of the floor on the underside of your foot, and it feels as if your body’s balance is being destroyed. In the spherical room, your voice reverberates, and you are caught in a strange sensation. Where the floor is sloped, your Achilles tendon is stretched, and in order to turn on the lights, you must search for the location of the switch and stoop over or twist your body. However, this is exactly what Arakawa intended. “Use all the things in this room and from now on you all will become real scientists. This is a place that draws out the possibilities of the body, inverting the destiny called death,” as Arakawa says. Modern society produced dwellings, divided up by horizontal and vertical planes, as something that cuts us off from the outside environment, isolates us, and protects us. In exchange for safety, humans end up losing sight of something important. We must turn our ears once more to the expandability of the body, or of life, that our five senses can teach us about. We move around various places within our room, touch the floor and walls, survey the outside through our window, and pass the time for a bit in the small space created next to the central kitchen. I realized that mysteriously, the longer we are in this space, the interior atmosphere that was initially dominated only by its strangeness rapidly changes into something kind and tender. In the end, I even came to feel that I wanted to stay like this, in this place, even longer. Something about it came to be nicely familiar. Certainly our bodily sensations are liberated, or stimulated, in a different form here than in daily life. However, did Shūsaku Arakawa really, seriously think that people could continue to live without dying? Was that not, just like his way of speaking, his style of bluff? “Trans Japan, Cis Japan.” In order to investigate the origin of this trans-Japanese ideology of Shūsaku Arakawa’s, which has acquired a universalism at the place where he has broken out of Japan to pass far beyond the domestic, I set off for New York. The long, thin form of Long Island sticks out from New York City like a fork, toward the east. Bioscleave House, which Shūsaku Arakawa and Madeline Gins designed, is in East Hampton, one of the vacation spots on the island. Bios is the prefix that refers to life, and cleave has two contradictory meanings: one is to sever, and the other is to join. From the road, every now and then I can see the blue sea appearing and disappearing. When I thought to myself that neat and trim buildings had appeared, it turned out to be East Hampton’s Main Street. As the car emerged from another grove of trees into a neighborhood of summer villas, from the openings between trees I could catch a glimpse of yellow and purple walls that seemed out-of-place amongst the homes in this kind of area. Everyday senses are severed and extraordinary tactile sensations are reconnected. Oh, Shūsaku Arakawa is Shūsaku Arakawa even here! Bioscleave House is of an even larger scale, powered up in comparison to the Reversible Destiny Lofts Mitaka. It’s spacious. And its eccentricity is overdone. The undulating floor makes a large basin structure. In the center, a kitchen is surrounded by a curved line, rooms are skewed at an angle around the exterior, the wall is penetrated, and the ceiling is tilted at an angle. In an open bathroom, two toilets are lined up back to back. Who on earth would you say would use this in what way? But at the same time, I thought that Bioscleve House was a mirror projection of the Site of Reversible Destiny. Then, in here we have the image of a micro cell, and in the interior of the cell, the image of an infinite universe is contained like an embedded structure. In the New York office of Arakawa+Gins, I listened to the stories of Joke Post, who was in extremely close contact with the two. On my return to Manhattan, through Ms. Post’s introduction, I stopped by the Houston Street building occupied by Shūsaku Arakawa and Madeline Gins’ studio and residence. The location is a busy street not far from the Soho area. One whole old building was their headquarters. I wonder what kind of state this area was in during the 1960s and 1970s? I noticed the fact that innumerable publications have been left behind. Scanning the titles of the books and magazines artlessly packed on the bookshelves with my eye, I was gripped by a strangely strong feeling. Science, Philosophy, Biology, Anatomy, modern thought, New Wave, Theory of Life, Organicism, Holism…books I myself had once read with all my might were inconspicuously lined up there. The Shūsaku Arakawa who departed from Japan early on and concentrated on an independent art practice in the far off soil of America was, at the same time, also precisely tracing the tides of popular intellectual discourse that were being published contemporaneously in Japan. In Arakawa’s early works, he often assigned titles that evoked images of life sciences: Waksman and Oparin. Waksman was the discoverer of antibiotics, and Oparin was the figure who thought of the origin of life as chemical evolution. It is certain that Arakawa maintained a close watch over developments in life sciences. Images of life and cells are clearly present in his artworks. Plus, he was well informed about the reductionist, mechanistic views of life at which modern life sciences had arrived. Life exists as a precise combination of micro components. Thus with the completion of the genome project, the secret of life thought to be infinite is also a clockwork orange consisting of countable genetic parts. end. In other words, it does not die. It suddenly occurred to me that I wonder if Arakawa knew about the biochemist Rudolph Schoenheimer who conducted research in New York in the first half of the Twentieth Century. Schoenheimer was a scientist who demonstrated that life was not a machine but a flow. We life forms exist in the constant flow of energy, matter and information. Everyday, cells are renewed and proteins are repeatedly synthesized and decomposed. The me of today is not the me of yesterday. One could say that the current me and the me from one year ago are almost completely different people on the material level. Simply by living we are continually expanding life outward. My exhalation that results from a combustion reaction floats in the air and becomes sugar in the vegetation. The metabolite that passes through my body scatters to the earth and the ocean and becomes a part of another life. Even if we don’t leave any children behind, life is always continuing by externalization and a kind of pass of the baton. It’s that this flow itself is the actual condition of living. Even if, for example, an individual within this flow is extinguished, life as energy and relations between matter is unceasing. Didn’t Shūsaku Arakawa put his body and soul into trying to let us recognize the reality of this kind of existence? Trans-Japanese Shūsaku Arakawa: he left this world from the soil of New York in 2010. In 2014, Madeline Gins passed away. Contrary to his words, didn’t he eventually end up dying? No, Arakawa said it this way: there is not one single person on this Earth who has died, it is simply that people vanish. Life is constant change, and it hands that life over to some separate life on this earth then vanishes. From that definition of life, Shūsaku Arakawa has not died. His memories and ideas have been surrendered to innumerable people’s hearts and even now continue to live on.